Is this Maplin Power Bank 4000mAh pwerful enough to power the Pi with all of the peripherals below? This is useful as I cannot order online, and it is currently £15. I have a Raspberry Pi Model B, which I plan to use build a small two-motor robot. The motors are powered externally by 4 AA batteries, and are to be controlled by at first by two large NPN transistors, and then a small also externally powered motor controller board (I found a working one lying around in a box). The Pi is to be controlled over a now-working wi-fi hotspot that it creates through a USB Ralink RT5370, and I may later want to add a USB webcam to give a view of what it is doing. Thanks for contacting Maplin technical support This product would struggle to power the pi reliably however N95LH would be suitable for this'. Is this true, or are they just trying to sell a more expensive product? Searching this forum and elsewhere, I have found stuff about 5200mAh batteries being used reliably. N.B. I have already built a power supply with several AA batteries and a 5 volt regulator, which works OK, but runs out really quickly, and only work reliably with alkaline batteries, and repeatedly buying batteries cost a fair fortune. That is why I am considering this lithium-ion battery instead. I did try a 9V with the regulator, but it did not provide the Pi enough power to boot. If you do suggest any other products, try to keep to stuff available in the UK please. Link may not work occasionally, just hit reload if needs be. 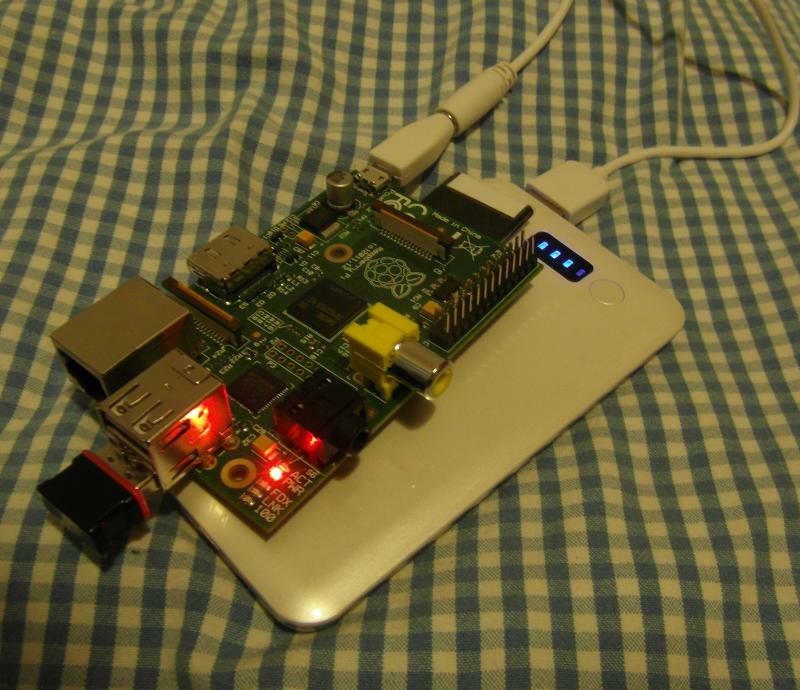 Either would power the pi and your peripherals. The pi could draw between 0.5A and 1A (depending what camera and how much wifi), so the 4Ah battery should last 4 to 8 hours and the 10Ah battery 10 to 20 hours. Choose the one which gives you the duration you want, or a smaller or larger as required. A standard 9V non-rechargeable PP3 has a high internal resistance so the voltage will drop a lot at these sort of loads. I've powered the Pi with cheaper battery packs than that and it's fine. With motors though there are a couple of extra considerations. First is that they have a very high current draw when the start up. The high current draw could potentially damage some of the circuitry in the battery pack. Secondly, motors don't just "stop". The process of stopping is what might charitably in other industries be called a sort of "regenerative braking"---that is to say that there is a slight back charge along the wires when the current cuts off as the motors cut-off. Make sure you include a diode to protect in this case both the Pi and the battery pack as every cut-off effectively becomes a temporary short-circuit due to the current reversal. This is usually taken care of with a diode, which most robotics add-ons include. The current drop over a linear regulator is very high as it actually uses the energy to do the conversion. Since a 9V battery doesn't have much juice to start out with, it drops too quickly to stably power the Pi. Even if you can't order it now because of your age, in the future it might be worth checking out MoPi though as this would get around some of the power problems. Specifically, it features a much more power efficient switched mode regulator, which is the same sort of thing they use in cell-phone chargers and PC power supplies. Not the answer you're looking for? Browse other questions tagged power battery or ask your own question.